When Archduke Franz Ferdinand was assassinated in Sarajevo on the 28th July 1914, and Austria-Hungry declared war on Serbia, which then caused the allies of Serbia, including the British Empire, to declare war on Germany and Austria, no-one knew that the next four years would see millions dying during hard-fought battles on the Western and Eastern Fronts. During that time millions died, were wounded, taken prisoner, until on the 11th November, 1918 at 5.00 a.m. an armistice was signed in Ferdinand Foch’s railway carriage in the Forest of Compiègne, which is approximately 37 miles north of Paris. The location was chosen due to it being discreet and quite remote. Britain - First Sea Lord Admiral Wemyss (in recognition of the fact that the Royal Navy blockade had forced the German surrender). France - Marshal Ferdinand Foch (commander of the Allied armies). Germany - Matthias Erzeberger (on behalf of the German Socialist Party, which had formed a government following the abdication of the Kaiser on the 9 November). Count Alfred von Oberndorff (German Foreign Ministry). Major-General Detlof von Winterfeldt (German army). Captain Ernst Vanselow (German navy). A total cease-fire was to come into effect at 11.00 a.m. that day, so the killing continued throughout the morning. After the British Forces had joined the hostilities on the 4th August 1914, the first man to die was Private John Parr of the Middlesex Regiment, who was killed in action on the 21st August 1914 aged just 17. After the Armistice had been signed, the last British soldier to die was Private George Edwin Ellison of the 5th Royal Irish Lancers. He was 40 when he was killed in action on the 11th November 1918, just ninety minutes before hostilities ceased. Eight hundred and sixty one died that day. The last soldier to die was Private George Lawrence Price who was shot just ninety seconds before the total cease-fire. He was 25 and served with the Canadian Infantry. These three men, along with 161 others, are buried in St Symphorien Military Cemetery close to Mons in Belgium. Private John Parr lies to one side and Private Ellison opposite, on the other. 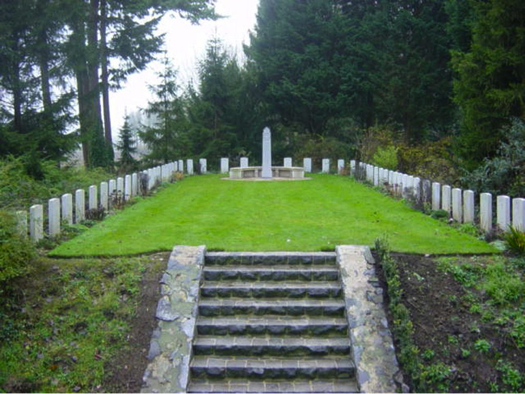 The short distance between those two headstones represents over one million Commonwealth lives lost. At 18.50 on the 22nd June 1940 another armistice was signed in the same railway carriage in the Forest of Compiègne. On this occasion it was France being forced by Germany to stop fighting against them, which was effectively a French surrender. Adolf Hitler sat on the same seat as Marshal Ferdinand Foch had in 1918 seeing this as revenge and deliberate humiliation. Three days later, the Armistice site was demolished by the Germans on Hitler's orders and the carriage taken to Berlin as a trophy of war. In 1945 it was taken to Crawinkel in Thuringia and burnt by SS troops. The carriage now on show at the museum in the Forest of Compiègne is the one that was behind the original one. It is presented in exactly the same way as it was set out on the 11th November 1918.